Enrico Gasparotto was a surprise winner at Amstel Gold, after defending champion Philippe Gilbert failed to produce his best form. The lesson of 2012, and it’s one we should remind ourselves of every new season, is that previous performance is no indication of future results: the form of riders can go down as well as up. This time last year, we were rubbing our eyes in disbelief as Philippe Gilbert simply rode away from the field through the Cauberg’s famous S-bend to win Amstel Gold. And there was something about the way Gilbert was marshalling his BMC team to control the final kilometres of this year’s race that might have tempted fans to think that a third consecutive win was on the cards. But the 2012 Philippe Gilbert has looked like a shadow of his former self. The lightning acceleration and confidence of last year has been transformed into a laboured unsureness. The Belgian still attacked through the Cauberg’s bends, but while he used to leave riders floundering in his wake, he now just gives them a launchpad to overtake him. A trio of riders followed Gilbert, and just as they closed down Katusha’s Oscar Freire, whose bold solo bid for victory came to an end just 100 metres from the line, Enrico Gasparotto of Astana got his timing and technique just right to win the race. It was a desperate, slow-motion sprint for the line, but of the three protagonists – Gasparotto, Peter Sagan (Liquigas) and Jelle Vanendert (Lotto-Belisol) – only Gasparotto was sprinting on his handlebar drops, like a sprinter. Sagan and Vanendert were on their brake hoods, sprinting like climbers. 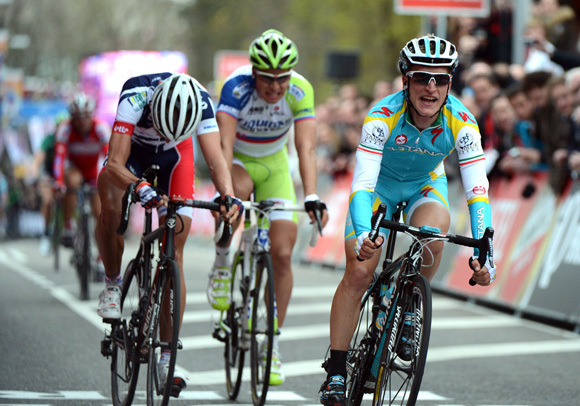 Runner-up Vanendert smacked his handlebars in frustration over the line, while Sagan looked bewildered at yet another major win escaping from his grasp: the Slovak has achieved a second, a third, a fourth and a fifth in the 2012 Classics. A win is inevitable, but losing is becoming a worrying habit for Sagan. It’s ironic that the Amstel Gold organisers moved the finish of their race to the top of the Cauberg in 2003 to spice up the race after a series of small group sprints in the previous finish in Maastricht. The climb now exercises a chilling effect on the race, which more or less follows the formula for a Tour de France stage: early break gets gap, early break gets closed down, the uphill sprinters sprint up the hill, the end. The teams with strong uphill sprinters – RadioShack, BMC, Lampre and, yes, Astana, kept control of the race in no different a fashion than HTC used to for Mark Cavendish at the Tour. Katusha, with uphill sprinter Joaquim Rodriguez, one of the pre-race favourites, also contributed, but their imaginative plan B – Oscar Freire to attack in the final 10 kilometres – made the difference between it being a good race and a dull one. Freire came within seconds of winning, after BMC and Lampre misjudged the final chase. The early break comprised nine riders. While none of them looked like a potential winner, there were a couple of interesting angles for them to explore. Garmin, who compensate for a relative lack of spending power for big names by putting a lot of thought into their tactics, got two men into it. The nine were also given a generous lead, which went out over 13 minutes. It meant that the pursuit was going to be a bit harder than it should have been. As the break hit the penultimate climb of the Cauberg to start the final 70-kilometre lap, helpfully denoted on the official race map in nature’s warning colour of red, their lead started to melt, as did any sense that they would be co-operating much longer. On the Loorberg, climb 25 of 31, Ag2r’s Romain Bardet attacked, drawing Lampre’s Simone Stortoni, Garmin’s Alex Howes and Euskaltel’s Pello Bilbao away. Topsport Vlaanderen’s Eliot Lietar and Howes’ team-mate Raymond Kreder laboriously bridged, putting six men at the front. From the peloton, Chris Sorensen (Saxo Bank) and Maxim Iglinskiy (Astana) tried speculative attacks, but all they did was provide the peloton with an additional carrot to chase – neither spent more than a few hundred metres off the front. The bunch was in sight behind the leaders on the straight, narrow slopes of the Gulperberg with 27 kilometres to ride. Bardet went again, taking Howes with him, forming a two-up of first-year WorldTour riders at the front. Bardet, who only turned 21 last November, was looking better on the climbs, although it might have come down to gear selection – while he spun away over the climbs a few metres clear of Howes, the American ground a bigger gear in his wake. And while the group had been eroded almost to its basic constituents, the peloton was starting to look ragged at the rear, losing more riders with every climb. BMC were down to two domestiques over the final climbs – Mauro Santambrogio and Greg Van Avermaet, but somehow they managed to control the race and lead the chase. Even at this point, they believed in their leader’s ability to do what he had done in 2011. They closed down an attack from Edvald Boasson Hagen that was one part aggression, one part strength, but unfortunately also one part bluff. Still, there was no more indication that anybody would be able to escape than on a flat stage of the Tour de France. Thomas Voeckler, inevitably, put in a dig, taking Peter Sagan with him. It’s not the first time in a Classic this year that Sagan has wasted energy that would be better used in a sprint following the wrong break, having also done so in Ghent-Wevelgem. Then again, maybe the experience of seeing the wrong team-mate – Vincenzo Nibali – go with the right break at Milan-San Remo has scarred him more than we think. Bardet had dropped Howes on the penultimate climb, the Keutenberg, and his own adventure came to an end with 10 kilometres to go. But there was only one dangerous attack in the entire race, and that was the surprising Oscar Freire, seven kilometres from the finish. At the time it looked like an obvious decoy for Joaquim Rodriguez: force rival teams to chase, giving Rodriguez a springboard up the Cauberg. It was such an obvious decoy, however, that BMC and Lampre relaxed a little too much in the chase. As Freire hared down the descent leading into the town of Valkenburg, the gap looked frighteningly big. He took the sharp left-hander at the bottom of the Cauberg with a six-second lead over Niki Terpstra of Omega Pharma, and 14 seconds over the BMC-led pursuit. Freire’s a resourceful and self-sufficient sprinter who is actually also a decent climber. Would 14 seconds be enough? Freire tied himself in knots up the climb, but his desperate glances back told us that the story of his race wouldn’t have a happy ending. Gilbert attacked through the S-bends, but as he passed under the footbridge near the top, Sagan attacked in pursuit of Freire, and in that moment, Gilbert’s race was lost. He was passed by Sagan, Gasparotto and former team-mate Vanendert, which must have caused some smiles in the Lotto camp. Freire held on for fourth, and Thomas Voeckler also passed Gilbert to take fifth. Gasparotto, taking his first victory since a stage of the 2010 Tirreno-Adriatico, was the biggest winner on the day, Gilbert was the biggest loser. It’s clear that the Belgian’s lack of results since joining BMC at the end of last year is starting to look like a crisis.